Wakey-wakey egs-n’-… cooked pig (were pigs common in that place at that time?)! Haha! I think they were! Maybe not as common and sheep and goats, especially on Iceland, but I’m sure they were around. Arne is Arne! And happy birthday to your sister, haha! 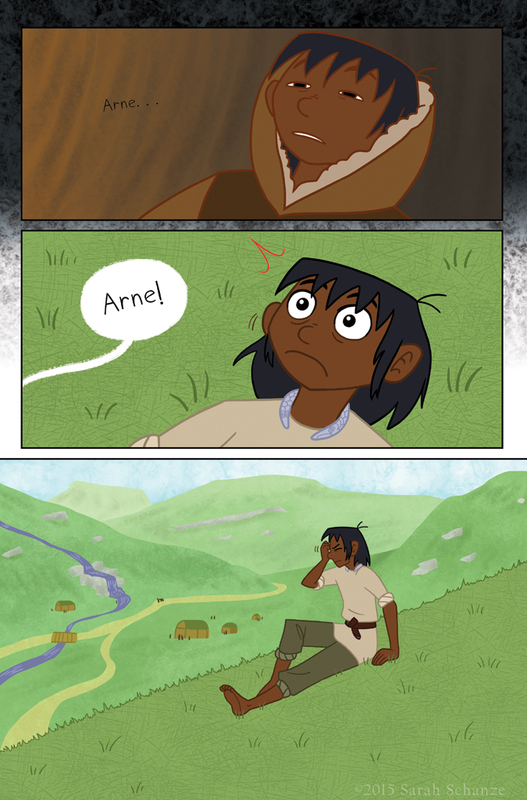 Is the collar around Arne’s neck the same one that was being skrtched in the last page? Actually no! But I can understand why you’d think that. In the previous page it was a piece of bone being carved (hard to figure since it’s not detailed/a dream sequence though, haha). Arne’s torque is made of silver. YES! The last of the main group to join. Feels good. Something IS going on! But what. How’s Arne pronounced? Ar-knee? Arn (as in yarn?)? Anyway, soo glad this comic is back! I waited so long! Haha! Arne like yarn, yeah. At least I’m pretty sure. And yay! Arn-eh. Arn rhymes with yarn, and then a short eh-sound. OH well there ya go! Thanks, haha! Haha! Eh, it’s supposed to be an eagle/hawk, but that’s kinda hard to see unless it’s the right angle. A Jormungandr necklace is a neat idea though, haha! Those last panels with the grass reminds me of last week when the spring weather was awesome and I decided to lay down on a blanket in our backyard under the shade our tree while my daughter played around the yard. It was quite refreshing. And then it got cold and snowed this week :P. Spring is kinda crazy around here this year. Haha, sounds nice! Also sounds like you live in Canada, haha! Hopefully you get a spring that lingers soon. Actually, believe it or not, I live in Utah! It’s not *usually* like this, but Utah does on rare occasion have weird seasonal weather. It was a very warm winter, where it mostly snowed on Christmas and last week, which is just odd.